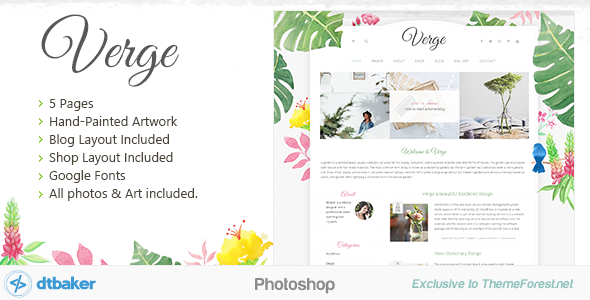 Verge is a artistic, clean and modern design featuring hand-painted watercolor artwork. Large Monstera leaves overlap the page edges, with pink leaves and tropical flowers and birds decorating the edges. The header is curved allowing for your logo to be large and centred on the page. This design would suit a home business blog, interior design, shop products like photography, wall prints, stationery and home made craft items. Please note the photos have been removed from the download file to make it smaller. All painted graphics ARE included in the file.